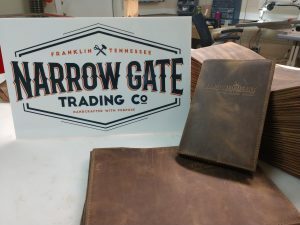 Author John Eldredge Selects NGTC For Special Project - Narrow Gate Trading Co.
Got a minute to hear a true God-story? For the past 14 years, a rite of passage has been happening at Narrow Gate Lodge thanks to author John Eldredge….and just a few months ago, the pieces all came together for our paths to cross again with the man himself. Since it’s beginning, Narrow Gate has used the book Wild at Heart, written by John Eldredge, as a central part of our ‘Service Level Experience’. The ‘Service Level’ is what we call the last 6-8 weeks of a young man’s time of discipleship at Narrow Gate Lodge. During that time, each young man listens to or reads the book Wild at Heart. It’s a powerful time of God speaking to our guys about passion, sacrifice, courage and manhood. It’s a pivotal point for most. The book challenges young men to rise up and discover a life lived with an adventurous and sometimes dangerous God. So for 14 years, each young man has read and/or listened to this book as part of their discipleship training at Narrow Gate Lodge…it’s just a part of our DNA. 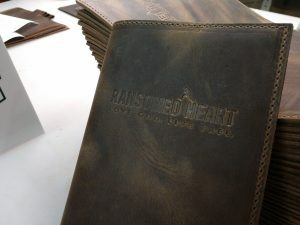 A few months ago, the NG Graduates who work at Narrow Gate Trading Co. got the opportunity to cross paths with John and his influential work again – this time by being asked to hand-craft leather journals for John’s ministry known as Ransomed Heart. 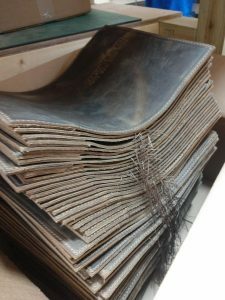 Imagine – young men who have been impacted by John’s book are now able to craft leather journals for others to use on their own spiritual journey!! Only God could arrange that!